ESPNNick Kyrgios attempted a no-look tweener. 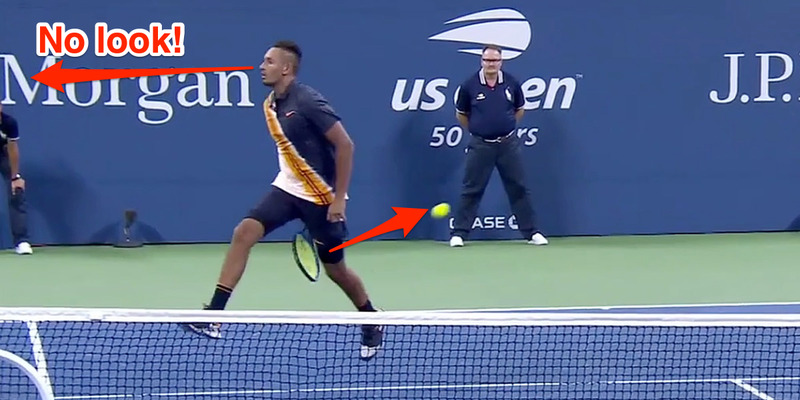 Nick Kyrgios attempted a no-look, between-the-legs return during the fourth set of a U.S. Open match. The ball went right to his opponent, who smashed it back over the net for the point. Kyrgios won the match in four sets. Australia’s Nick Kyrgios beat Radu Albot in four sets in the opening round of the U.S. Open on Tuesday, but it wasn’t a perfect match for the No. 30-ranked player in the world. In the fourth set, up 5-1, Kyrgios had to charge the net to return a drop shot. Once there, he decided to get fancy, returning the ball through his legs while looking away, in a basketball-esque fashion. Instead, the ball went right to Albot, who smashed it back over the net for the point. With such a sizable lead, nobody seemed to be too upset with Kyrgios, including the commentators. Nonetheless, he might want to reconsider the no-look, tweener, which really didn’t seem to fool anyone.